October is National Popcorn Poppin’ Month, and there’s plenty to celebrate about this low-cal, high fiber snack. For those nights when you just want to catch up on TV with something crunchy to nibble on, popcorn is an infinitely wiser choice than chips or pretzels. October is National Popcorn Poppin’ Month, and there’s plenty to celebrate about this low-cal, high fiber snack. For those nights when you just want to catch up on TV with something crunchy to nibble on, popcorn is an infinitely wiser snack than chips or pretzels. 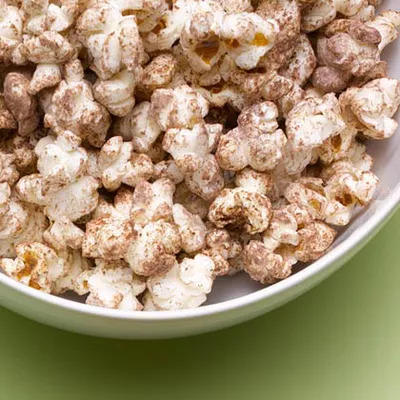 Air-popped popcorn is delicious on its own, but if you want to kick things up a notch, whip up a batch of this Cocoa-Cayenne Popcorn. It’s sweet, spicy, and crazy addictive. A 2½ cup serving may sound like a ton, but don’t be surprised if you find yourself reaching for more. We say go for it--each serving has only 137 calories, which is pretty unheard of for such a large snack portion! Plus, cayenne has a nice little side effect of boosting your metabolism.